Hauskaa lauantaita, tervetuloa viikon Allsorts haasteen pariin! Viikon emäntänä valitsin aiheeksi "tytöt ja leidit", naistenpäivän kunniaksi. Korttini on keväisissä tunnelmissa tulppaanien ja narsissien kera. Hi; Happy Saturday, it's time for a new Allsorts Challenge! We have celebrated International Women's Day this week. My theme this week is for "Girls and Ladies". We have a stamp prize. It's such a lovely image Mervi and the pretty soft colours you have used compliment it perfectly. Have a good weekend and thank you for a super theme this week, I enjoyed it. Thanks for the great challenge Mervi, and your card is absolutely beautiful! Love the soft pastel colors you used! This is a really gorgeous creation, love the image and the fabulous design. Absolutely gorgeous! Thank you so much for sharing this with us at Creative Inspirations. Good luck! 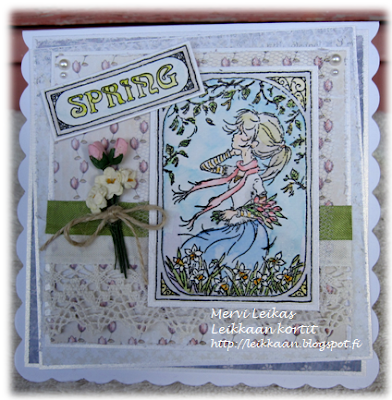 This sure is a card for spring, with the soft colors and flowers. Beautiful! Hi Mervi! 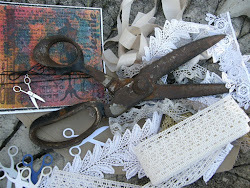 Your card is very beautiful with lovely embellishments, the image is so cute! Thanks for the great inspiration!